Known for coffee, emeralds, the Amazon and the legend of El Dorado, Colombia is one of the most attractive Latin American countries for intrepid travellers. Its rich history is marked by the Spanish colonization of the sixteenth century, who endowed the country with a defensive system that could prevent pirate attacks or other invaders arriving through the Caribbean Sea. Some colonial cities such as Cartagena de Indias or Bogotá have kept their architecture of this era practically intact. After the Cry for Independence in 1810, the country struggled to recover its origins and the history of many of the indigenous ethnic groups that had inhabited Colombian lands since antiquity. Today, most ancestral traditions and their rich culture are present in many of the museums of the big cities, as well as in the theaters. Colombia has thousands of parks and natural spaces where you can discover the best flora and fauna in the country. It's greatest reserve, the iconic Amazon, has always been one of the great challenges for adventurers, who long to travel this tropical region. 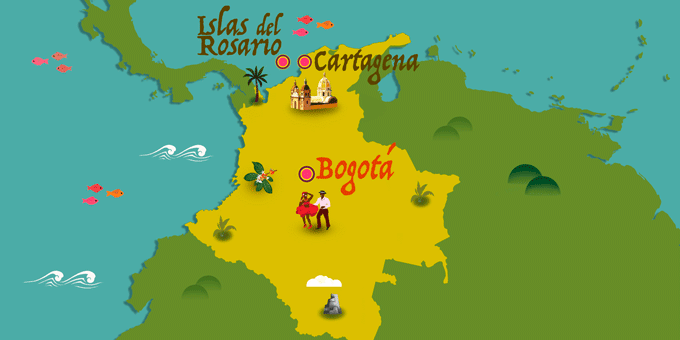 British nationals can enter Colombia for up to 90 days as a visitor without a visa. There are no mandatory vaccinations for entry to Colombia.